These dry cold Winter months can really wreck havoc on our skin. Last year my skin went crazy around Christmas time & I was struggling to find products and a routine that would work for me. If my skin gets too dry I breakout, if it gets over moisturized I break out, so it's been quite the struggle to find products that will consistently work for me. I should also mention I have extremely sensitive skin, I can't use a lot of products because they will not only break my skin out but also cause uncomfortable irritation. In the past, I've suffered from dermatitis caused by ingredients within skincare & makeup such as sulfates. I'm telling you all of this because I want you to know that when I say these products are gentle and that they work I truly mean it. I have tried so many products out and have so many let downs that I'm excited and confident these products will work for others if they work for me! So without further ado here is my skincare routine! Step 1 // Makeup Removal: To remove my makeup prior to washing my face I use the Purity Solution Cleansing Oil . I start by putting one pump into my palm, I then rub my hands together to get it warm & then rub the oil into my face. This oil will break up all the makeup on your face, once all the makeup is loosened you can rinse your face with water. This product is much gentler than a typical makeup remover or makeup wipe! Step 2 // Cleanse: To cleanse my face after removing my makeup I like to use the Benefit Cleanser . This cleanser is extremely gentle on my skin and removes any products leftover after using the cleansing oil. I like that there are no harsh ingredients in this cleanser that could potentially dry out my skin. You need to be careful with facial cleansers as some are way too harsh to be using every day! I generally steer clear of any product that says "Acne Clearing" in bold letters as those are sure to make your skin dry! 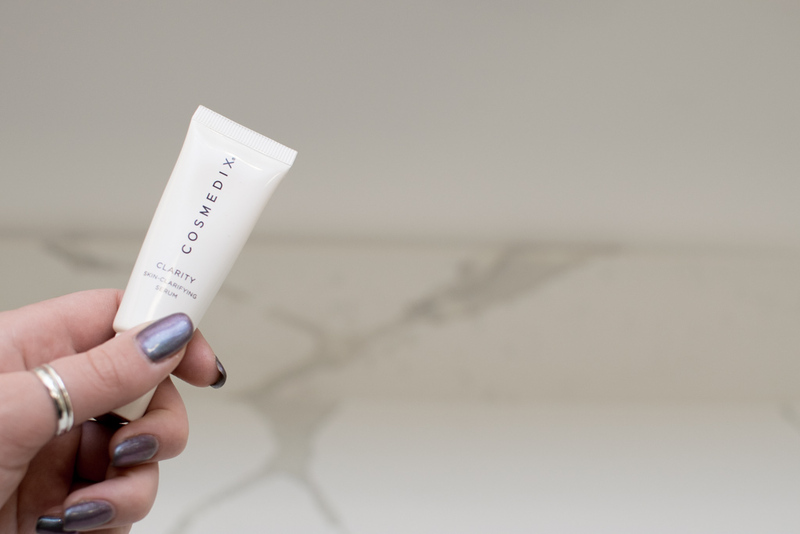 This cleanser is the perfect product to use every day with no worries. Step 3 // Tone: I've been using this Glow Tonic toner for a little over a month now & it has made the biggest difference in my skin. 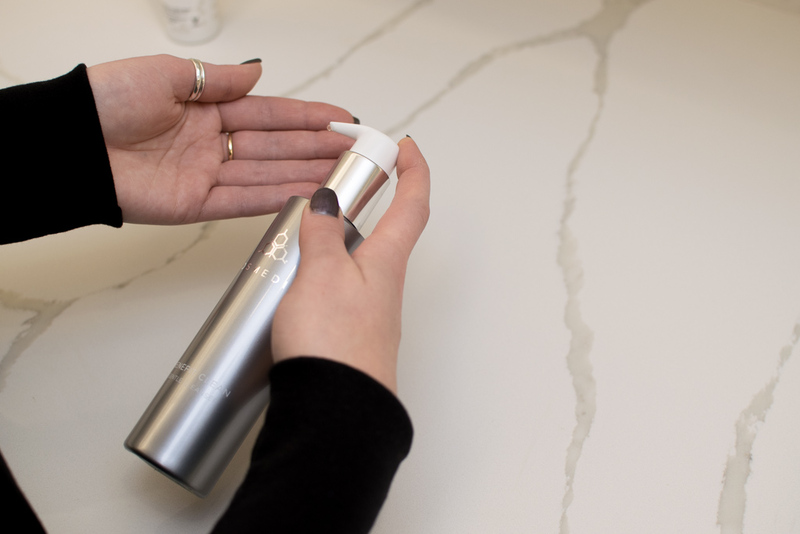 Prior to this product, I had been using a different toner/astringent but I wasn't able to use it every day as it really dried out my skin & sometimes even stung. I apply this product to a cotton pad after cleansing my skin. 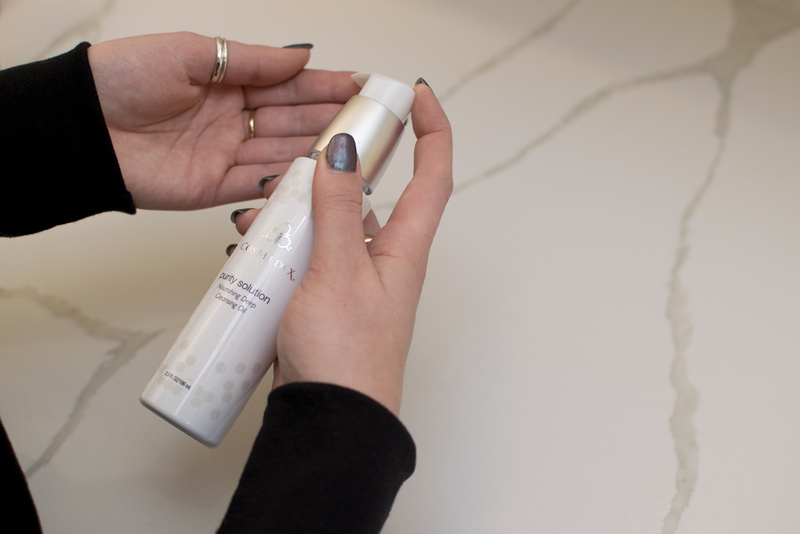 This toner helps to firm & exfoliate skin by removing dead skin cells which leaves your face 'glowing'. This product also has Ginseng and Aloe in it which will hydrate your skin! Step 4 // Spot Treat: Who likes blemishes?? Not me! There are so many spot treatments out there that claim that they will clear up your blemishes but do they really? Usually not. Most that I have tried, leave me with a red flakey mess even if the area is cleared of acne; and really who cares if you don't have a zit if you now need to deal with covering up that mess! 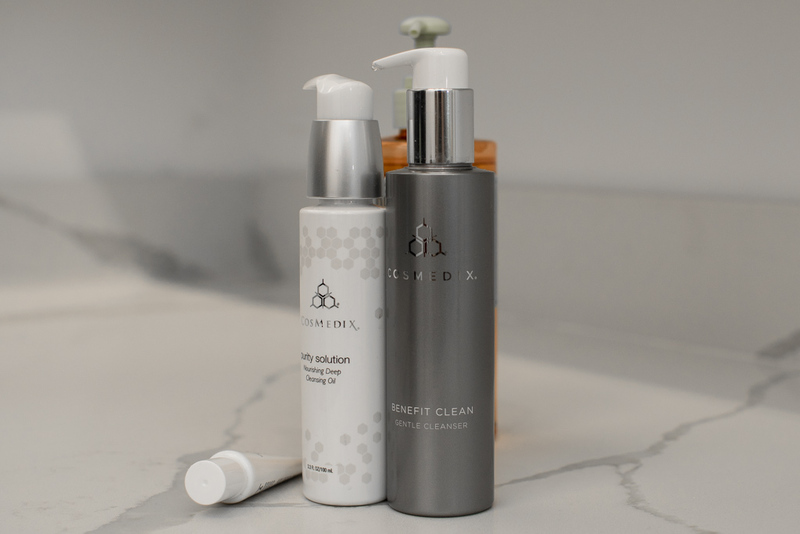 The Clarity Serum has been a life saver for my skin, I have the travel size but it comes in a much larger bottle normally. This product really will clear up my breakouts within a day or two. I apply a small amount to the area at night and when I wake up it's always looking 10x better. This serum contains Retinol and Salicylic Acid which help to exfoliate and clear any clogged pores. Additionally, it has Willowherb, Teatree, and Aloe which reduce the redness and irritation that come along with breakouts. Trust me when I say you need this product! Step 5 // Moisturize: This is one of the most important steps! Your skin needs moisture! Without it, every little imperfection will look much worse. 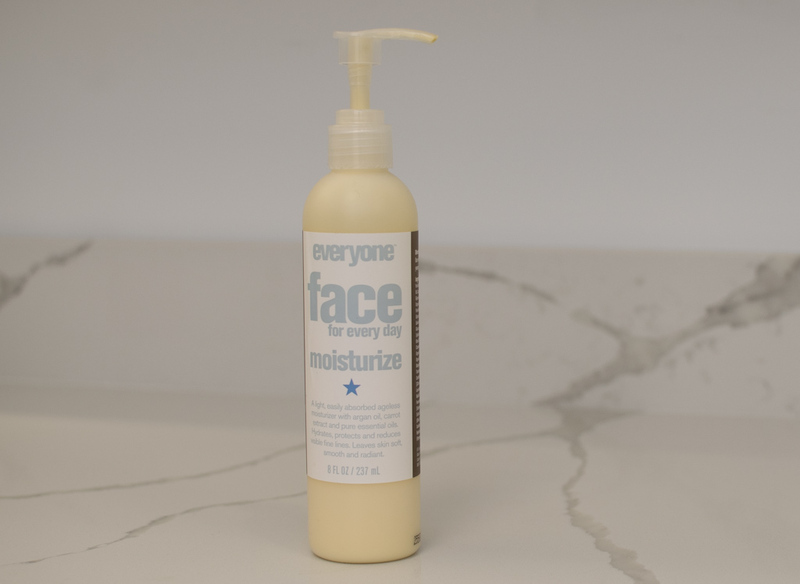 The Face for Everday Moisturizer is a gentle lightweight daily moisturizer that hydrates with Argan Oil, Carrot Extract, and Essential Oils leaving you with baby soft skin. I have been using this product now for over 2 years. This is one of the only moisturizers I will use as it's free from harsh ingredients and has no added fragrances. I generally purchase this product at my local health food store but I've noticed it popping up in drugstores as well! I apply a dime size amount of this to my face and neck each night and rub the remainder into my hands. Step 1: Rinse: In the mornings I only rinse my face with cool water, I use no cleanser as I feel it overdries my skin and is unnecessary. I think the reason some peoples skin will become irritated and dry is that they're over cleansing. If you properly cleanse your skin at night there is no reason to wake up less than 12 hours later and apply another cleanser. It's good to leave some of the natural oils on your skin! Step 2: Moisturize: I apply a small amount of the Everyday Moisturizer and let it set in for about 10 minutes prior to applying any makeup. This moisturizer lays well under makeup as it doesn't leave a greasy layer on the skin. I hope this post was informative, let me know if you use or have tried any of these products! I haven't heard of most of these products, so it's good to hear about them. I keep seeing Pixi show up, and am hoping to try some of their products soon! I adore the Pixi Glow Tonic! :) I have to order it again! Ooooh I was using the Pixie Glow Tonic for a while and then forgot to restock when I ran out. It really does brighten your skin! I'm the opposite, I use a cleanser in the morning but in the evenings I just wash my face with a gentle soap in the shower instead! My skin is pretty sensitive too, but it's gotten better in the last few years. In high school it was even more sensitive! The Glow Tonic is seriously THE BEST! It's such an effective, yet gentle toner! Benefit is actually the only brand I've ever used that's in your routine, and I've only ever tried their makeup. I definitely need to check out these items from your routine. I'm always looking for a good moisturizer. I love the Glow Tonic! Cosmedix has amazing skin care products that I love too. Glow Tonic is amazing! I decided to try a new toner a little over a month ago, and I'm 100% switching back to the Glow Tonic - it works wonders! It has been suuuuuuper dry here so I basically live off toner and moisturizer! I haven't heard of any of these products so thank you for sharing them. I am in the process of looking for a toner, as I was using just moisturizer before but I want to see if that can actually make my skin better, so I might give this toner a try. 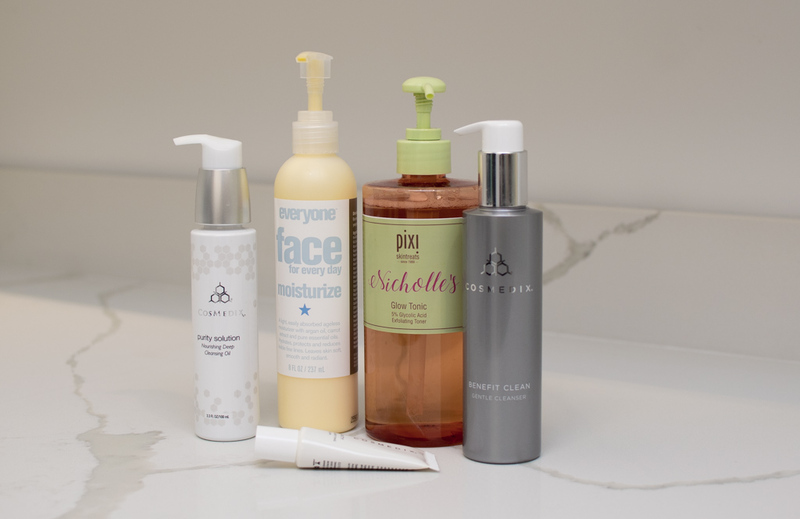 I use that pixi glycolic toner too and LOVE it!